I understand talking about your finances may be a difficult topic for some, but if you think about the bigger picture -- you are building the early foundation of a strong marriage. You may even be saving your marriage from divorce. So much time and consideration goes into planning your big day. Couples decide on everything from an overall wedding theme (formal, casual, semi-casual, etc.) to the colour of shoes the bridal party will wear. It is common for couples to be caught up in their wedding plans, honeymoon and even where they will live when everything is said and done, however many newlyweds forget to talk about their finances as a newlywed couple. You can save yourself from a lot of arguments and misunderstandings about money if you take the time to discuss -- your finances. I understand talking about your finances may be a difficult topic for some, but if you think about the bigger picture -- you are building the early foundation of a strong marriage. You may even be saving your marriage from divorce. 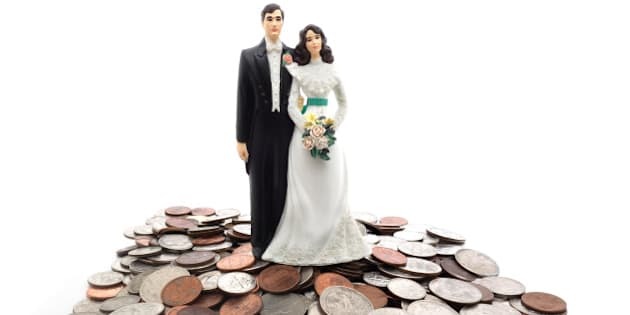 A recent study says 41 per cent of young married couples say money is affecting their marriage in a negative way and when you factor in children, 35 per cent of couples say they are at their wits end concerning their finances. A well-planned budget will not only keep you crazy in love, it will help you to obtain your financial goals and keep your household finances at a manageable level. I must admit, creating a budget together for the first time may be a trying task however I promise you, it gets better. In the long run, your mind will be at ease and you'll be grateful that you and your spouse took the time to iron out the details of your household budget. To take your planning to another level, you can also track your finances on your phone with a budgeting app. When you are open and honest about your finances with your spouse, you will start to build a long-lasting foundation for your marriage. Alternatively, if you start to hide your money, mismanage your bills and grow a mountain of debt, you will create holes in that foundation, which can lead to the ultimate demise of your union. It is time to make that special trip to the bank and get your finances all in a bunch. Financial experts recommend married couples have at least one joint chequing account so you can handle your day-to-day bills to run your household. If you are convinced you and your spouse are not joined at the hip and you want some space for your finances, you can gain some independence by having your own savings account. This will give you the flexibility you need for buying special gifts for your better half and even splurging on yourself. Life as a newlywed is filled with a variety of everlasting memories from remembering your uncle's humourous speech at your wedding to getting used to seeing the love of your life every day. You may even be adjusting to the fact your spouse snores or hogs all of the bedsheets for themselves. Whatever the case, your new life together will ensure countless memories with love. To ensure your marriage stays on track, remember to keep debt management top of mind. When couples are mindful of their finances -- they are able to focus on what matters the most to them -- their new life together.